Summary:Secure and Safe check re-ordering site. The #1 site to re-order checks. Special promotion for return customers now available! Checks Unlimited is a safe and secure place to order checks. Their check quality exceeds American Bankers Association Standards – which means they have the highest standards for security and quality in the check business. Every check order they process is done with the utmost care and attention to make sure your privacy and security is safe. When you order checks from ChecksUnlimited, they're shipped in tampered-resistant packaging. 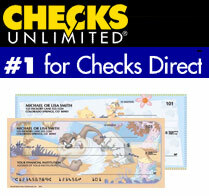 Join the over 30 million customers that have ordered checks from ChecksUnlimited.